In an Orwellian pincer move, a cross section of powerbrokers is launching a blitzkrieg on speech. The censors of speech are tightening bit and bridle to control who speaks, what one speaks and how one speaks. Last week our group of pro-lifers in Port Erin on the Isle of Man were confronted by another group using the f-word as conjunction, preposition, interjection and adjective, trying to rein in our right to free speech. Pro-life groups are also being muzzled like dogs by buffer zones in England and on the Isle of Man. Students at redbrick universities are using violence to ‘de-platform’ conservative speakers. Masked thugs stormed Jacob Rees-Mogg’s speech at Bristol University calling him a ‘fascist’, ‘Nazi’, and ‘racist’. Even radical feminist Germaine Greer had her vocal cords tied in knots by anti-speech students at Cardiff University because of her views on transgenderism. 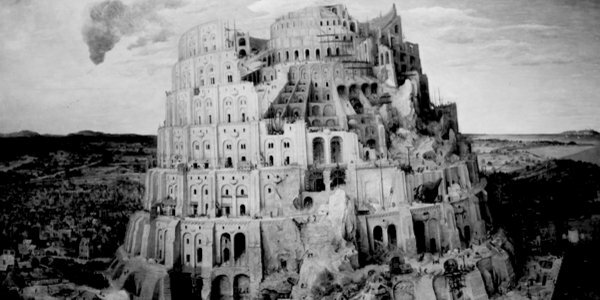 The story of Babel begins with people attempting to create one world with one language. Globalisation begins with the McDonaldisation of language. The ‘whole earth’ now has ‘one language’ and ‘one set of words’, reports the Genesis story. The words ‘language’ and ‘all the earth’ occur five times each in the narrative. This McDonaldisation of language is an artificial construct that restricts and coerces. It is not the result of human creativity and diversity that has so far been blessed by God in the narrative beginning with creation. Abruptly and rudely we are thrust into the narrow world of Babel (Genesis 11) after streaming through the broad and diverse world of the Table of Nations (Genesis 10). The Table of Nations underlines the linguistic diversity that already exists. The children of Japheth, Ham and Shem speak ‘with their own language’. Two verses later, the Tower of Babel story hits the reader like a stinging slap in the face: ‘And it came to pass, that all the earth had one language and one vocabulary’. The linguistic totalitarianism of Babel follows the linguistic pluralism of the Table of Nations. While the word for ‘language’ used in the Babel story is ‘lip’, the word for ‘language’ used in the Table of Nations is ‘tongue’. ‘One lip’ refers to the rhetoric of world rule, power and hegemony. It was part of the vocabulary of the Assyrian king. The Assyrian empire would abolish the variety of languages to bring the people under one rule. The story climaxes with God issuing a statutory warning about the terrifying totalitarian possibilities of this one language that brooks no alternative. God confuses and destroys this new language. ‘Babel’ comes from the Hebrew word for confusion. ‘To deverbalise a society is to dehumanise it,’ wrote Oxford scholar J L Austin. Deprive human beings of free speech and you will turn them into animals. This is why when people run out of words or are limited in their vocabulary they use will use Molotov cocktails, stones, or fists to make a point, as ferocious animals react when provoked. This week, our pro-life group experienced behaviour that was even worse. When our opponents were losing ground, they got a stooge to borrow a motorcycle without a muffler and rev it continuously for more than 15 minutes in an attempt to deafen us, frighten us and silence us. Thankfully, the engine broke down and the hooligan silently retreated – he simply lacked the vocabulary to conduct an intelligent argument.